George and I took a drive yesterday, just around the streets of our little town, to see what photo ops were happening on a Sunday afternoon. Now, this town is not big. And I have lived here for twelve years. I don’t claim to know everything about this town but I do know a lot of things, and I enjoy going off the beaten path. 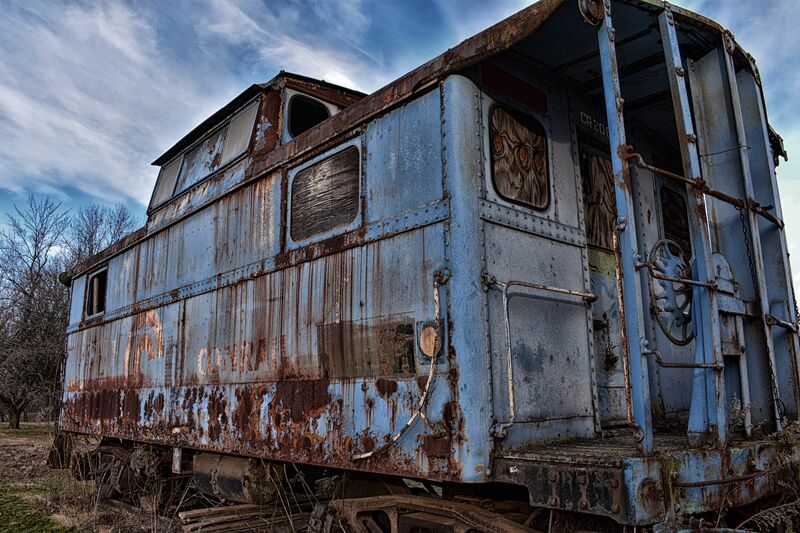 So, imagine my surprise when we drove past an abandoned caboose, parked in the middle of a field. On a personal-size length of track. That I had no idea was there. Of course, George was like, “Oh, yeah, there’s that old rail car…odd, innit?” And he’s got no idea why this caboose is in the middle of a field or how it got there, but he’s ridden past it a bajillion times because it’s on one of his favorite bike routes. For him, the caboose in the field on a tiny length of track was business as usual (if there’s a caboose in the field, it must be Tuesday), and he seemed mildly surprised that I wanted to stop and commit it to digital memory. As it was profoundly not what I was expecting, I felt like I had no choice. So behold! An abandoned Conrail caboose to nowhere, in the middle of a field in Lewisburg, PA. Which is one of the least Tuesday things I can think of.